Paal kanji (Milk porridge) - A Magical Energy drink for Pregnant Women! Home » Pre Pregnancy Care » Paal kanji (Milk Porridge) – A Magical Energy drink for Pregnant Women! 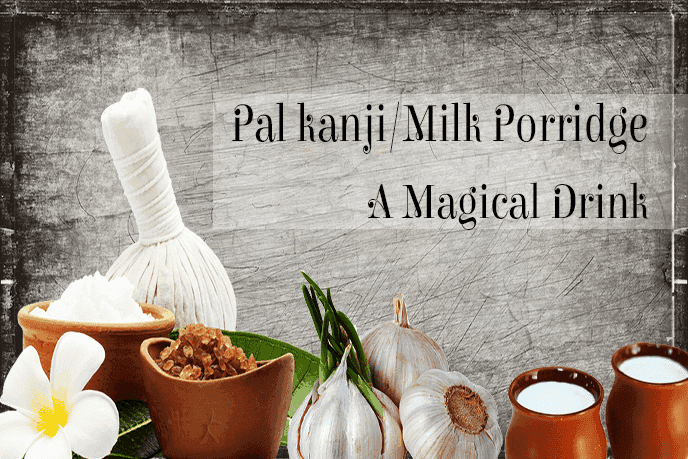 Paal kanji (Milk Porridge) – A Magical Energy drink for Pregnant Women! My Achi (Grandma) often says Paal kanji (Milk porridge) is a magical energy drink for woman during pregnancy! Paal kanji (Milk porridge) is adviced to be consumed after 7th month of pregnancy because this is the stage where your breasts begin to gear up for feeding your baby. Best practice is to consume early morning before 2 hrs of having breakfast (For example: If you have paal kanji/milk porridge at 6 am, then have breakfast at 8 am). You can have paal kanji (Milk porridge) twice/thrice in a week till delivery and also after delivery as it helps in lactation. 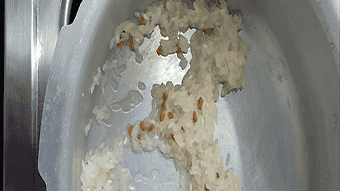 In a pressure cooker add one handful of rinsed boiled rice and fenugreek seeds. Add 1 whole peeled garlic cloves. On the other hand, crush dry ginger and saranaveru. 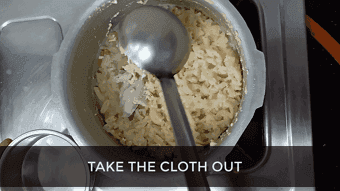 Put the crushed dry ginger and saranaveru in a white cloth and tie it. 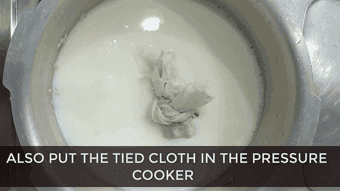 Leave the white cloth also in the cooker. Pressure cook for 5-6 whistles. Once done take the white cloth, squeeze it and drink that milk first. 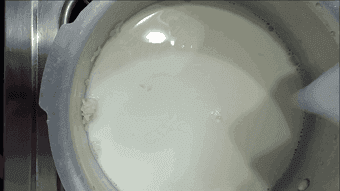 Then add 1 cup of milk to the mashed kanji. 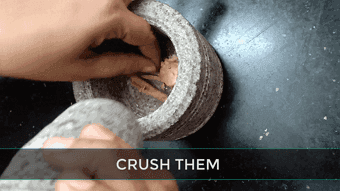 Jaggery(optional) – In a separate bowl powder the jaggery, melt it and filter it well. Now add the jaggery to the mashed kanji and enjoy drinking your paal kanji. If you want sweeter you can always add more jaggery. 1. In a pressure cooker add one handful of rinsed boiled rice and fenugreek seeds. 2. 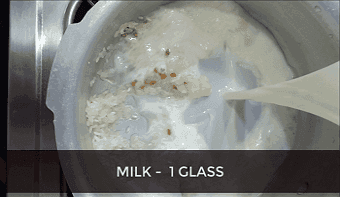 Add 1 glass milk. 3. Add 1 glass water. 4. 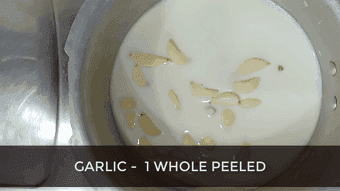 Add 1 whole peeled garlic cloves. 5. On the other hand, crush dry ginger and saranaveru. 6. 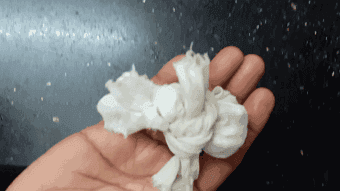 Put the crushed dry ginger and saranaveru in a white cloth and tie it. 7. Leave the white cloth also in the cooker. 8. Pressure cook for 5-6 whistles. 9. 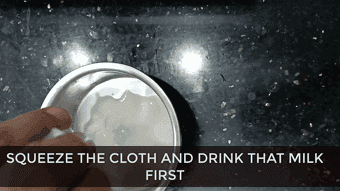 Once done take the white cloth, squeeze it and drink that milk first. 10. 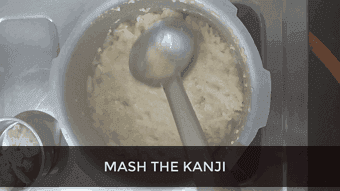 Now, mash the kanji. 11. 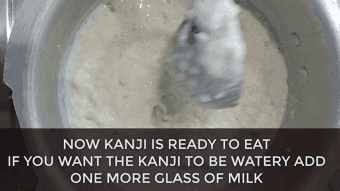 Then add 1 cup of milk to the mashed kanji. Helps to boost baby weight. Antimicrobial properties of garlic cant limit the growth of bacteria and help to keep the immune system healthy. Pregnant women tend to get vaginal infections and this helps to fight against the issue. Rich in iron content and prevents anaemia. What’re your thoughts on this simple paal kanji (milk porridge) recipe for pregnant woman? Let me know in the comment section below. Thank U Maha for your ratings!